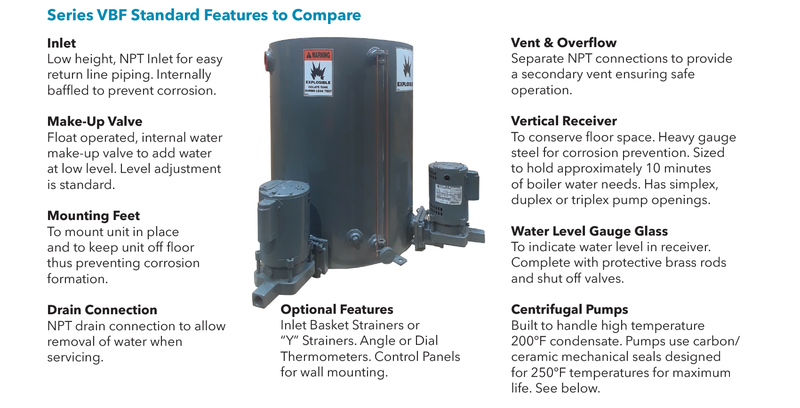 The Hoffman Series VBF, vertical boiler feed unit provides engineered reliability for precise water level control in modern steam boilers. 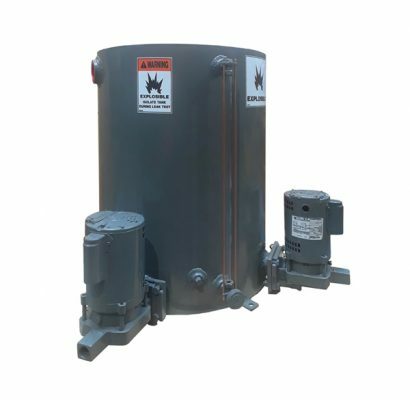 Units are supplied in 30, 50, 100 and 200 gallon steel receiver sizes, with gauge glass assembly and mechanical make up valve. Pump are the system proven, close coupled, centrifugal pump with bronze impeller, renewable bronze wearing ring, carbon ceramic/mechanical seal rated to 250ºF and cast iron housing. Motors are vertically mounted drip proof ball bearing design with built in overload protection and stainless steel shafts. Pumps are controlled by a dedicated pump control on the boiler (available as optional) responding to water level change in the boiler. This maintains optimum steaming level in the boiler for maximum performance and safety. Receiver sizes 30, 50 and 100 gallon have provisions for simplex or duplex pumps. 200 gallon receiver has a third pump opening with a blanked off flange for the field addition of a third pump if required.